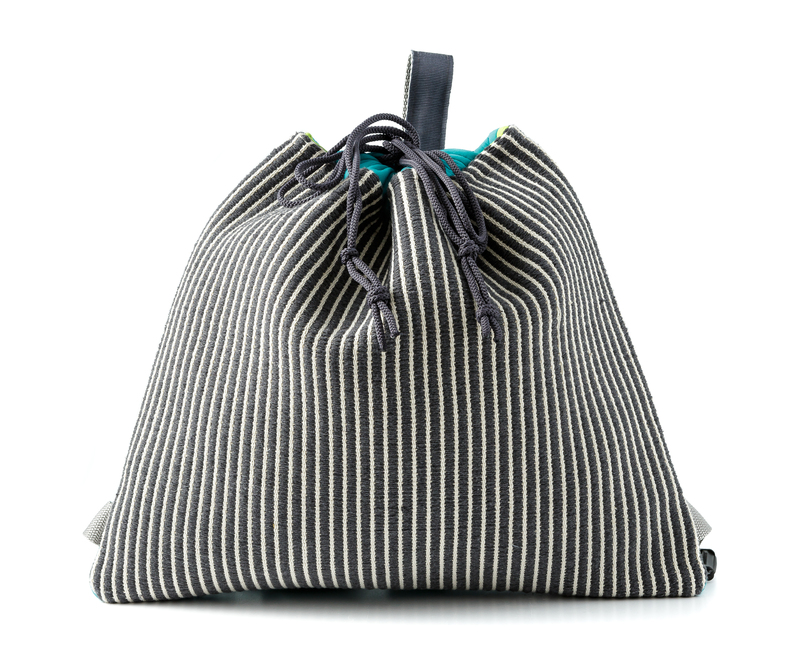 This practical backpack with drawstring closure and adjustable shoulder straps which combines comfort and elegance is made with handloom woven fabrics inspired by the traditional saddlebag, sa bertula, with its striped geometric motif. 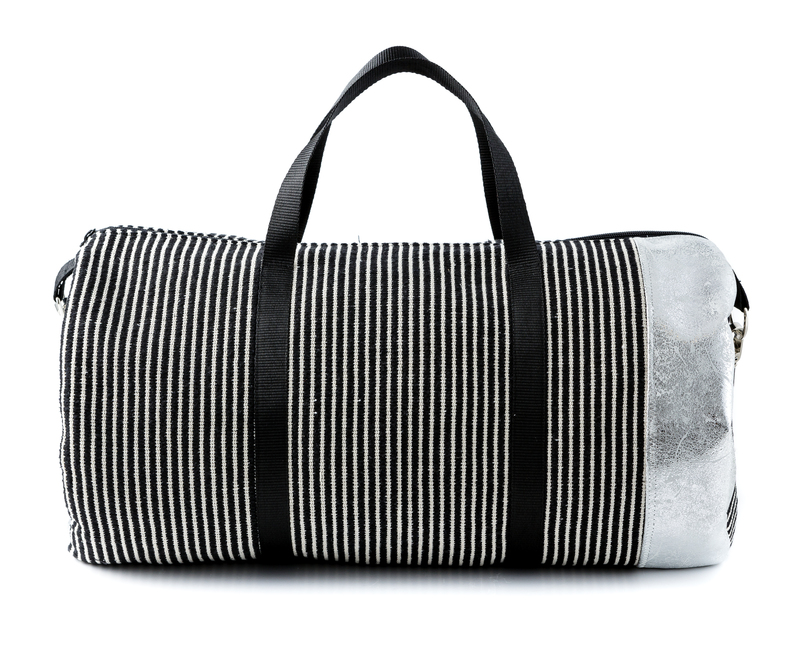 Practical and capacious, this bag with the cylindrical shape typically used for sports is crafted using elegant loom woven silver leatherette fabric with geometric motif, taken from the local tradition, a refined and exclusive combination. This practical backpack with drawstring closure and adjustable shoulder straps features the juxtaposition of neon-coloured technical textiles and handloom woven fabrics inspired by the traditional saddlebag, sa bertula, with its striped geometric motif. Elegant and capacious, this practical bag meets everyday needs with exclusive taste, thanks to its versatility to hold a tablet or a laptop easily. 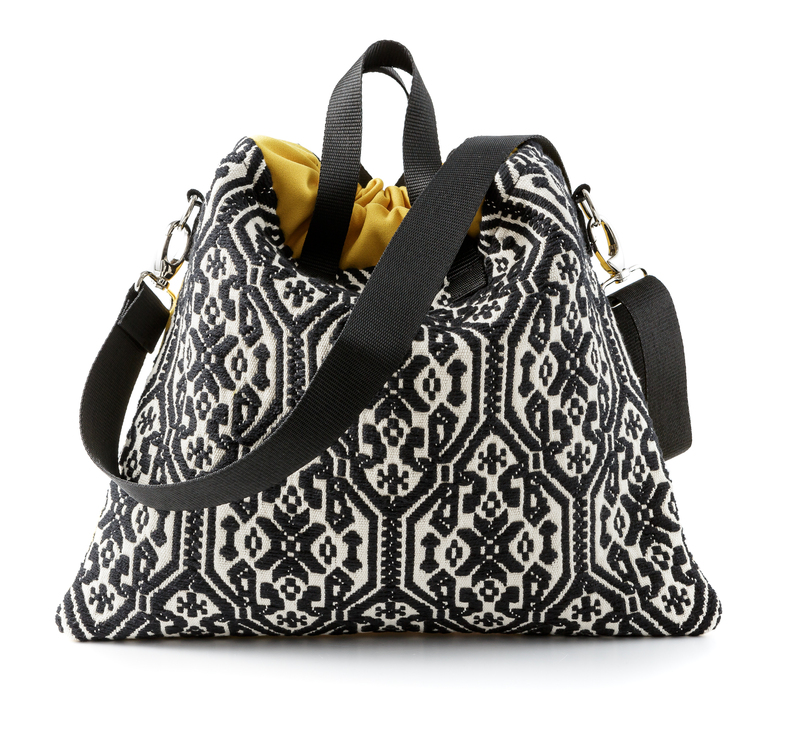 Handcrafted, it can be used as a handbag or as a bag with a shoulder strap, and it has a small practical bag inside. 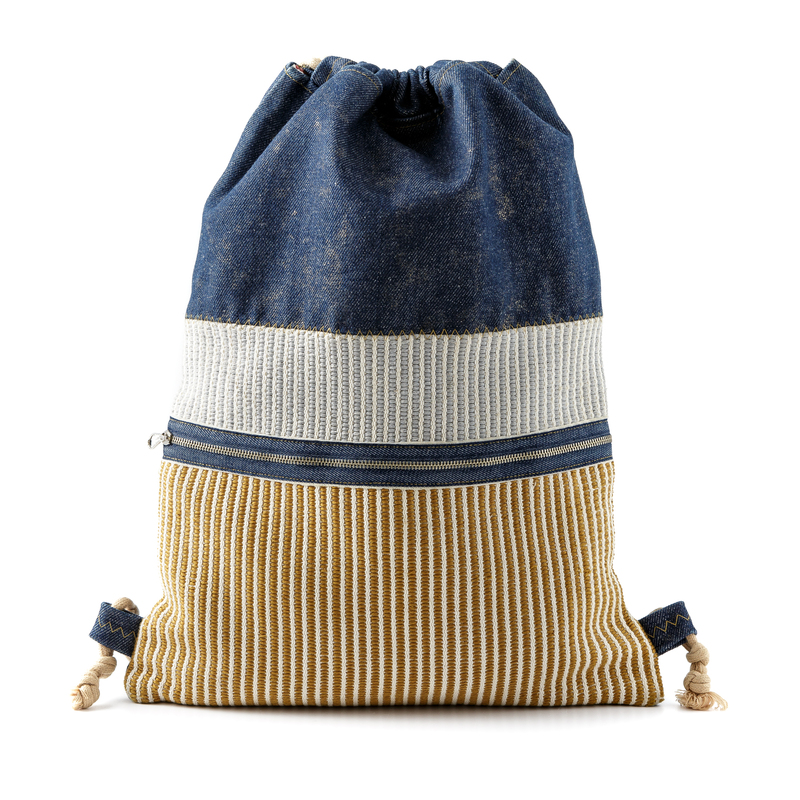 This practical backpack is crafted using loom woven fabric with fine vertical lines taken from the traditional saddlebags, exclusively combined with denim fabric so as to create a striking item. Manuela Morittu’s original bags stand out for their modern style and clear-cut shapes in which the fabrics, hand-woven using the loom, taken from the local tradition, are combined with the latest technical textiles, in a refined contrast of practicality and elegance. An inventive personality with a passion for fabrics, Manuela followed her personal training path thanks to which she learned cutting, tailoring and creative sewing. She put these techniques to use in her business, that is, in her handicraft workshop which she set up in 2013 in Bonorva, where she started by creating home décor items and accessories. However, she decided shortly after to focus only on the handicraft production of her characteristic line of bags. Her unique artefacts are designed and carefully crafted as fine pleasing objects. 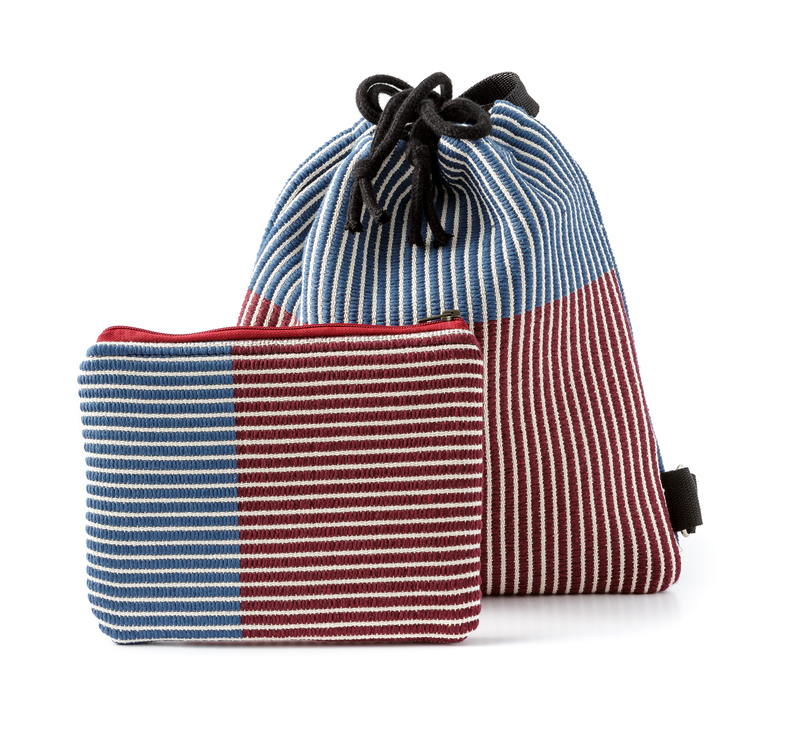 Her bags, which can be customised in colour combinations and in details, are made using traditional woven fabrics, with distinctive graphic effect geometric motifs. She also collaborates with handicraft workshops that certify the exclusive manual weaving techniques employed. Consistently with her typical contemporary style, Manuela actively promotes her artefacts on the social media that enable her to reach out to an international clientele sensitive to her exclusive craftsmanship. Manuela Morittu’s distinctive production counts exclusive bags which can be customised to a wide extent in size and the combination of different fabrics based on a range of prototype models featuring minimal and contemporary lines. The Weekend Bag line is designed for short trips and includes the holdall, the backpack and the laptop case, made with fine artisanal fabrics with graphic designs. The Freestyle line is conceived for a young and modern clientele, reviving the metropolitan art of street artists through the use of technical textiles and neon colours, finely combined with hand woven fabrics. Each product, from backpacks, bags, holdalls and laptop cases, to the refined pochette clutch bags, is finished as a one-off creation according to the customer’s every wish. The bags are realised according to a range of prototype models individually customised following the customer’s instructions, carefully selecting the fabrics and all the finishing details. Each artefact is, therefore, a unique item which is entirely handcrafted.